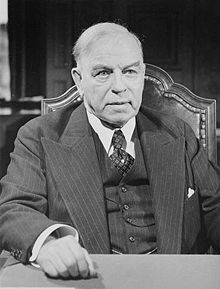 William Lyon Mackenzie King was Prime Minister during the 18th Canadian Parliament. The 19th Canadian Parliament was in session from May 16, 1940, until April 16, 1945. The membership was set by the 1940 federal election on March 26, 1940, and it changed only somewhat due to resignations and by-elections until it was dissolved prior to the 1945 election. It was controlled by a Liberal Party majority under Prime Minister William Lyon Mackenzie King and the 16th Canadian Ministry. The Official Opposition was the so-called "National Government" party (the name which the Conservatives ran under in the 1940 election), led in the House by Richard Hanson and Gordon Graydon consecutively as the three successive national leaders of the party, Robert Manion, Arthur Meighen and John Bracken did not have seats in the House of Commons. With the selection of Bracken as national leader in December 1942, the party became known as the Progressive Conservatives. The Speaker was James Allison Glen. See also List of Canadian electoral districts 1933-1947 for a list of the ridings in this parliament. Following is a full list of members of the nineteenth Parliament listed first by province, then by electoral district. Vancouver East Angus MacInnis C.C.F. William Bryce (by-election of 9 August 1943) C.C.F. Winnipeg North Centre James Shaver Woodsworth (died 21 March 1942) C.C.F. Stanley Knowles (by-election of 1942-11-30) C.C.F. Cape Breton South Clarence Gillis C.C.F. Joseph William Noseworthy (by-election of 1942-02-09) C.C.F. Joseph William Burton (by-election of 1943-08-09) C.C.F. Mackenzie Alexander Malcolm Nicholson C.C.F. Melfort Percy Ellis Wright C.C.F. Yorkton George Hugh Castleden C.C.F. Government of Canada. "16th Ministry". Guide to Canadian Ministries since Confederation. Privy Council Office. Retrieved 2006-11-09. Government of Canada. "19th Parliament". Members of the House of Commons: 1867 to Date: By Parliament. Library of Parliament. Archived from the original on 2006-12-20. Retrieved 2006-11-30.